H.P. Lovecraft's Cthulhu Mythos is a primary influence of countless iconic authors, and even now, nearly a century after its publication, its themes of cosmic horror and madness remain at the forefront of supernatural literature, as well as being highly influential in the mediums of music, film, and video games. But Lovecraft's expansive imagination didn't stop there. This five-story volume contains some fascinating rarities outside the Cthulhu Mythos. The Lurking Fear includes examples of Lovecraft's earliest weird fiction including "Hypnos," "What the Moon Brings," Imprisoned With the Pharaohs," and "Memory," (inspiration for the 2014 film of the same name) as well as the title story, "The Lurking Fear," a traditional horror study commissioned by George Julian Houtain to be run as a serial in Home Brew magazine in 1923 that has served as the source material for multiple films and been adapted into a comic book. Only H.P. 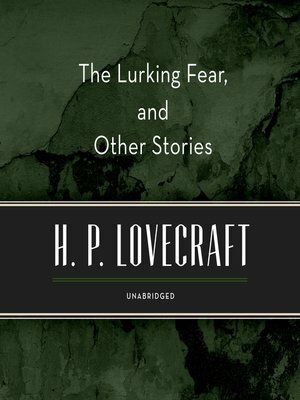 Lovecraft could conceive the delicious and spine-tingling horrors you will find within the pages of this unique five-story collection.